The Hotkeys Q and W, that were previously used by the tracking pies, will be occupied by the Quick Favorites and the context menu, so those can't be used anymore. Some icons changed their appearance and needed to be updated. Some of the pie menus were spawning sub-pies, which, if I am not mistaken, are not really the way to go for pie menus. Also, I found them not that practical, so those have been removed. The tracking pies are designed to combine the most important tracking and solving operators and settings into a handful of workflow oriented pies. This allows you to work fullscreen without toolshelf or sidebar open, which is often nice when you are working with footage. The hotkeys for those pie menus are all located on the left side of the keyboard, so you can work fast without having to let go of mouse or pen or reach to far. The pie menu that one would probably use most often is "Tracking". 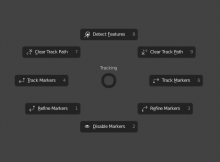 You can track, refine or clear tracks forward by pressing 'E' and dragging to the right (and right+up/down), and track brackwards by pressing 'E' and dragging to the left (and left+up/down). The two other options in the Tracking pie menu are Detect Features and Disable Markers. In this pie the icons are already using the dedicated tracking icons mostly. 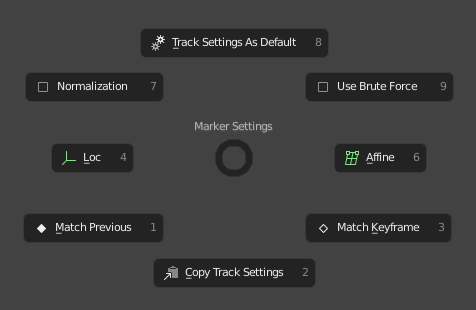 The Marker Settings Pie gives you access to the settings that one needs the most when setting up the marker for tracking. While there are more than 2 Motion Models only the 2 most used are exposed: Location based tracking and Affine tracking. That's usually enough for most use cases. 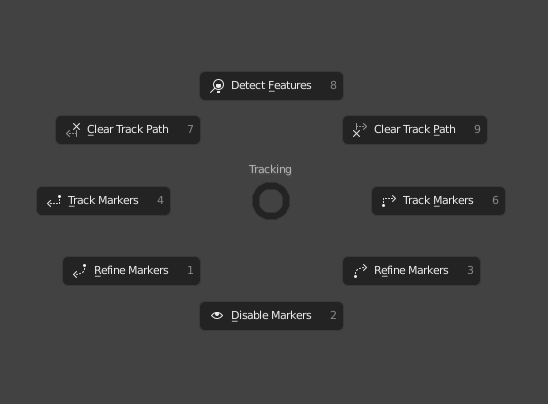 This pie also let's you either set the tracking settings of the active marker as default settings for new markers or copy the active track's settings to the selected markers. 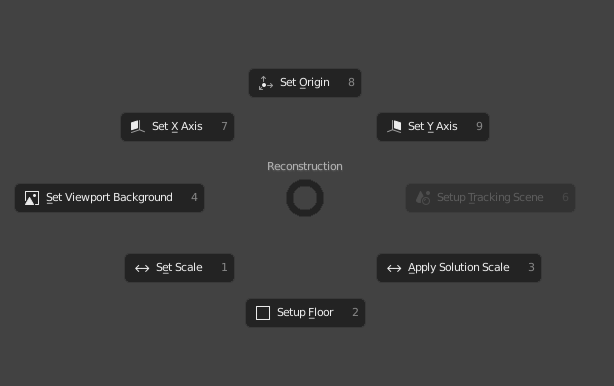 You can choose to track based on the previous frame or by keyframe and enable or disable Brute Force and Normalization. There 2 icons that need to be addressed though: Loc and Affine. Currently they use icons from a different context. Some frequently used options to control appearance and behavior of the clip. In my experience this is the second most used pie. The most important operator here is "Solve Camera", that's why it is located to the right. The opposite site does, well, the opposite: Clear Solution. 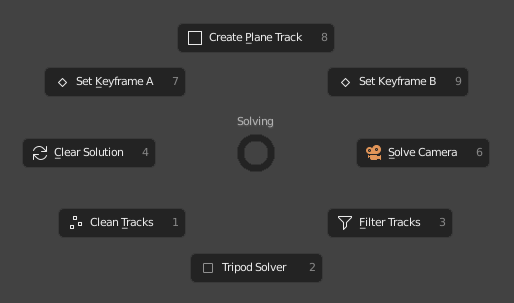 The other thing that is important during solving is to set the keyframes. The hotkeys for that used to be Q and E, but since Q is reserved for Quick Favorites, those need to be removed. So it's nice to have them easily accessible in this pie. Once you have a good camera solution you can use this pie to setup the tracking scene, orient the camera, or just set the clip as viewport background image. The controls are arranged semantically: The Floor setup is at the bottom, Set Origin at the top, X and Y axis left and right of the origin. Setup Tracking scene being the next logical step after Tracking and Solving it is also arranged to the very right. Icons here should be fine for the most part. The one thing I am not quite sure yet is whether or not to keep the Apply Solution Scale Operator in there or maybe replace it with 3D Markers to Mesh. In the future I plan to add one or two more pie menus, however those would also involve some custom operators and I am not sure if those would belong into "official" pie menus or if those should be distributed as an addon. Sebastian Koenig (sebastian_k) added subscribers: William Reynish (billreynish), Sean Kennedy (hype). Pie menus seem to work best when executed via a single key, because you really need the other hand on the mouse or pen to perform the gesture. 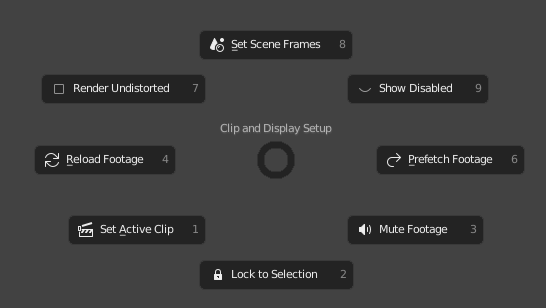 Are there really no free keys available in the Clip Editor? Some of these seem to be a mix of toggles and commands. We don't really use pies elsewhere for toggles because there's no feedback that something changed. Normally it's either for setting an enum (Mode, Pivot, Orientation etc) or a category of commands (Snap To). I think these more workflow-oriented pie menus are also ok, but perhaps worth considering if it make sense to include the toggles or not. I'm wondering if there may be a place in one of these menus for Lock marker. Perhaps in the Shift E menu, in place of either Track Setting as Default or Copy Track Settings? We should not use wrong icons. It doesn't help readability and makes the icons hard to keep updated. In the Shift-E menu, I think we could just remove the icons there. As for the 'specials' menu, we no longer call it that. It is the contextual menu, and its purpose is to display a contextually relevant menu of the most used commands in a given context. By default it doesn't use the W key, but right-click.